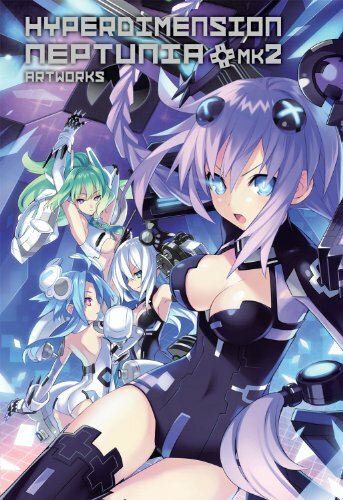 This is the video game artbook of Hyperdimension Neptunia and its sequel Hyperdimension Neptunia Mk2. The book's a 152-page paperback. And it's translated by Udon from the original Japanese artbook 超次元ゲイム ネプテューヌ＋mk2 アートブック that was released in 2011. Publisher Udon Entertainment has been translating a lot of those titles into English. About half the book features designs of the girl characters from the two games. There's much to see as character design is broken down into the different costume styles and elements, such as facial expression. There are some notes written for the costumes and they should make more sense to players who are more familiar with the characters. Each character has two pages, and there are more than 30 characters featured. Other than the brief design notes, there's the character profile which is just made up of vital statistics. Then there's just a one sentence introduction to the character which is not much of an introduction at all and so you won't really know any of the back stories to these characters. What's strange but not uncommon is the character line sketches are located at the back of the book instead. So most of the coloured character art are in front. Other than the character designs, the rest of the artworks are the full colour splash art pages. The splash pages features the characters in different settings and costumes that aren't just those from the game. Well, you'll get to see the usual swimwear, pajamas, school uniforms, maid dresses, etc. There are a few with more overtly sexual theme but not to the extend like Sonicomi. The splash art appears at the front and the middle of the book. The illustrations in the middle are event and story graphics. I've not played the game so I can't really tell the difference but the illustrations in the middle are able to stand on their own even if you have no idea about the story. The art is beautiful and should appeal to those who like Japanese style teenage girl game characters, and of course fans of the game.